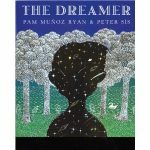 Home » Blog » News » The Dreamer by Pam Munoz Ryan. Heading to Alaska. I read it in manuscript form and now it is a beautiful book illustrated by Peter Sis. The novel is about poet Pablo Neruda youth in his native Chile. Here’s the blurb, but it doesn’t do this outstanding book justice. You must read this book. I’m getting ready to head to Alaska tomorrow for 8 days, 11 flights, and I’m not sure how many presentations, but I will be keeping you up to date here providing I have internet access up north.